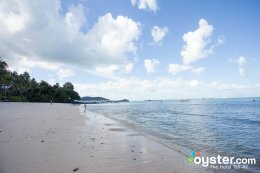 If there's one thing Thailand is known for, it's the country's stunning beaches. And Phuket, Thailand's largest island, is home to some of the best for ocean lovers. Travelers and locals alike often spend their days splashing in the water, snorkeling along the reef, or diving from cliffs. 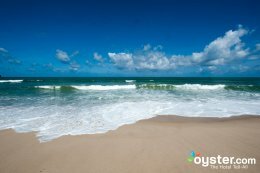 For the most stunning ocean views and easy access to the beach, we suggest considering staying at a hotel with its own waterfront. 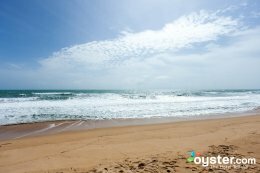 Click through to see some seriously stunning shots of Phuket beaches. But we warned, this slideshow will likely cause wanderlust. 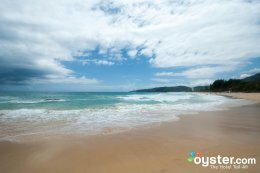 Beyond Resort Karon is an upscale, adult-only hotel claiming the distinction of being the only resort set right on Karon's beach. The location makes for some wonderful ocean views - from the rooms, both pools, and its restaurant - as well a relatively peaceful atmosphere. Guest units are spacious with furnished balconies, though there have been reports of issues with mosquitoes. Rates are certainly on the expensive end of the scale for this caliber of hotel, but you're paying for its unique setting and superb sea vistas. Banyan Tree Phuket is one of the larger five-pearl resorts in Phuket, with over 100 guest villas on sprawling garden grounds that can be difficult to navigate. Manmade lagoons and the Andaman Sea provide beautiful water views. Large villas include luxurious details like private outdoor spaces with hot tubs or pools, designer furniture, and pillow menus. Features here are more akin to what you'd find at an all-inclusive in the Caribbean - cooking lessons, boat rides, a kids' club, several restaurants, a sandy beach, a freeform pool, yoga, a golf course, bikes, and even a baby elephant for photo opps - than what's usually on offer in Thailand. 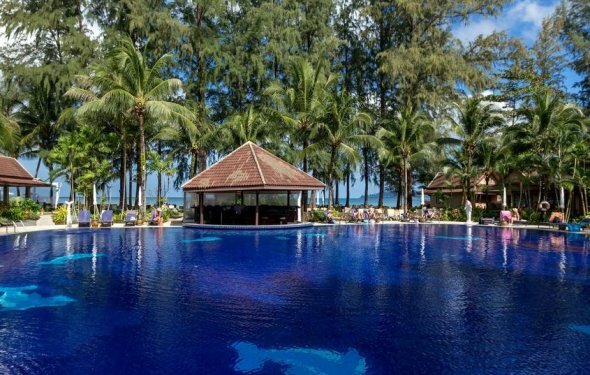 JW Marriott Phuket Resort & Spa is one of the most luxurious resorts (with a price tag to match) in Phuket. The tropical grounds and friendly service are almost impeccable. A location near Phuket International Airport is convenient for catching flights, but less so for visitors who want to explore Phuket. There are three upscale swimming pools, a luxe spa, and 12 distinct restaurants and bars. Contemporary rooms include balconies and mini-fridges, while the Villa has a private pool. 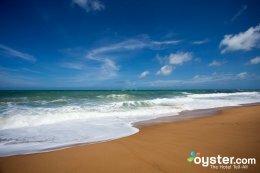 Downsides are that the beach isn't suitable for swimming and past guests have reported that kids have a run of the place. Trisara Phuket is one of the most luxurious and private five-pearl properties in Phuket. Guests are met at the airport by an SUV and shuttled to the stylish resort, complete with a private sandy beach, infinity-edge swimming pool, three restaurants, and gorgeous accommodations with private pools and views of the Andaman Sea. There's a private boathouse and a popular Jazz Brunch on Sundays. Prices are high, but freebies include airport transportation, a breakfast buffet, chocolates, and Wi-Fi. For honeymooners and families who can afford it, Trisara is hard to beat. SALA Phuket Resort is a romantic option in a series of upscale-to-luxurious resorts on Mai Khao Beach near the Phuket International Airport. What differentiates this property from its many competitors is its intimate size, rooms with gorgeous outdoor bathrooms and soaking tubs, and swimmable stretch of beach. Two infinity-edge pools face the ocean and there isn't much to do on-site besides borrowing one of the two kayaks, riding bike, visiting the spa, or eating at the gourmet restaurant - although that keeps plenty of guests just about as busy as they want to be. This Moevenpick Resort outpost, part of a global chain, is a huge upscale property set in extensive tropical gardens overlooking Phuket's beautiful Karon Beach. Facilities are plentiful and include four pools, four restaurants, a spa, and plenty of activities to keep the kids amused. A breakfast buffet is included in the room rates. Most rooms and villas have balconies with sea views, though, while generally well-maintained, some units are starting to show signs of wear. Rates are on the high side but it's a solid option for this type of high-end holiday retreat. The 205-room Cape Panwa Hotel is an upscale property located directly on Panwa Beach. It's a solid choice for families and couples who want fast access to the hustle and bustle in nearby Phuket, but prefer to sleep and eat in a quieter location. The hotel makes transportation easy with a free shuttle and parking, and guests who want to stay on property can enjoy the white sand, outdoor pool, several restaurants, and fun cultural activities. Rooms are spacious and stocked with creature comforts like pillow menus and balconies, though past guests have reported occasional cleanliness issues. Larger groups (or honeymooners) can upgrade to a Lodge or Villa with a private infinity-edge pool. 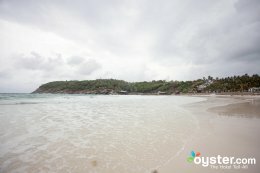 The Racha is a five-pearl eco-chic resort on the small island of Racha Yai in the Andaman Sea. It's a 35-minute boat ride from Phuket to get there, and there's a charge for the transfer. Once guests arrive at the island, they're greeted with the sight of white-washed villas built with clean lines, in harmony with the natural surroundings of the tropical landscape and water. The villas are clean and comfortable; some have private pools and spacious outdoor bathrooms. Recreation facilities are top-notch: ATVs, water toys, tennis courts, a spa, and more are all on offer. 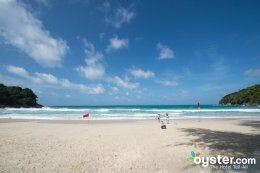 Be warned, though: The stunning sandy beach is a hot spot for tourist boats from Phuket and is overrun with day trippers often, making it not exactly ideal for those who want a romantic and quiet tropical vacation. 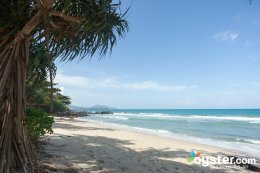 Le Meridien Phuket Beach Resort is a huge, self-contained complex surrounded by lush jungle that looks out over its own sandy beach. The hotel's large size can make it feel a little impersonal, but its scale does mean a vast array of facilities, including an enormous pool and a range of sport facilities. Spacious rooms have been sleekly renovated and many include lovely sea views. All this doesn't come cheap though, and you might also find yourself paying for plenty of extras - including Wi-Fi - if you book the room-only rate.